If you haven’t heard of it, then you probably will very soon! The KonMari Method is a different way of purging and organizing your home and people seem to LOVE it! But what if you’ve tried the KonMari Method and it didn’t work for you? Or even just the sound of it makes you panic? What are the alternatives to the KonMari Method? Can you still have a tidy and organized home without worrying about “sparking joy”? #3 Would You Buy It Again? How can I find out more about the KonMari Method? Why do I need an alternative to KonMari? Do these alternatives really work? Maybe we should take a step back and first of all briefly describe WHAT the KonMari Method actually is? KonMari is short of Marie Kondo. She is a Japanesse Tidying Guru and has the cult following to prove it! In 2012 Marie Konodo published “The Life-Changing Magic of Tidying Up: The Japanese Art of Decluttering and Organizing“. It took a few years for American readers to take notice and it became a New York Times Bestseller in 2014. The KonMari Method is in the spotlight once again with the debut of the Tidying Up with Marie Kondo on Netflix. If you haven’t had a chance to watch it yet, then you really should! It’s a great show and gives a lot of useful advice. I’m not going to describe the full KonMari method here, but basically it involves sorting through all your belongs and holding each item in your hands. As you are holding that item if it “sparks joy” within you, then you keep it. If it doesn’t, you get rid of it! The other part that she is very clear about, is that you have to sort the entire category in one go! She suggests taking every piece of clothing that you own and piling it all up on your bed! Only then can you truly appreciate how much you have and how much you can stand to part with. She even has a very specific folding technique! The method is a little bit more involved than that, but that’s the basic idea. I’m a fan of the KonMari Method, but I’m also realistic. This method is NOT suitable for everyone! I worked as a Professional Organizer for many years and the one thing that I learned was that there is no “one-size-fits-all” decluttering method. Every person and situation is different, so everyone needs alternative methods. Life situation might be changing, such as a child moving to college and needing a full set of kitchen utensils etc. Your general energy level and how much sleep you’ve got! Not sure where to begin with decluttering your home? Pick up my free Ultimate Guide to Decluttering Your Home eBook. I take you step by step through the decluttering process and give you loads of tips and hacks to get your home clean and organized in no time! So if the KonMari Method is not right for you, what is the alternative? Are you doomed to have an untidy house for the rest of your life? Of course not! I’ve got your back! 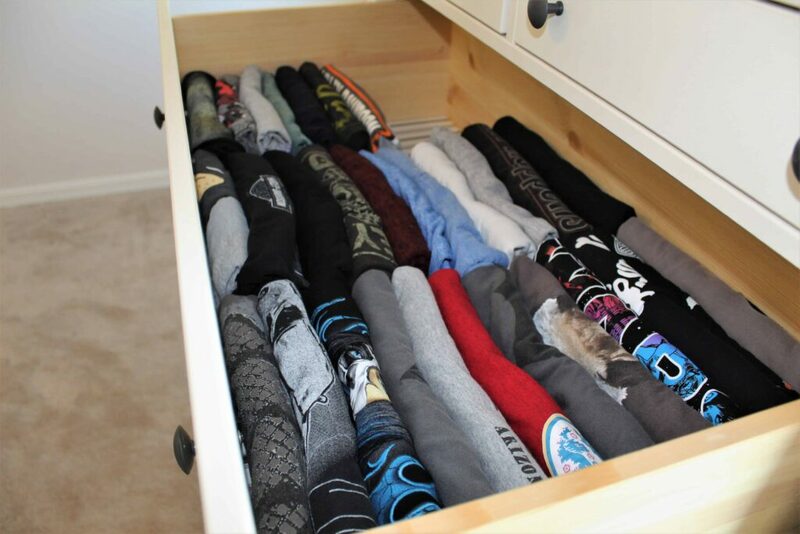 Below are 5 alternatives to the KonMari Method that will help you get your home organized and tidy… without making you feel stressed or overwhelmed! The first of our KonMari alternatives is to “edit” her categories! It is always a good idea to categorize your possessions as you are sorting them, but Marie Kondo’s categories are pretty broad and covered a lot of things. The number one rule for professional organizers is sorting “like with like”. Basically putting all similar items together allows you to REALLY see how much you have! Do you really need 3 corkscrew openers? Does your daughter need 17 sets of pajammas? How many ballpoint pens are you ever actually going to use? You get the idea! Rather than use the broad and sometime very large KonMari categories (“Miscellaneous” is basically your whole life! ), you can start sorting on a smaller scale with smaller categories. Why not start with sorting through just your shoes and boots? Or tackle all your sweaters? Maybe it will be easier for you just to sort your kitchen plasticware in one session, rather than the whole kitchen? Leading on from smaller categories is decluttering in shorter sessions. Most of us live very busy lives and finding the time to sort through all the clothing in the house might just be too difficult. People often use “I don’t have enough time” as an excuse to NOT declutter their homes. So by starting small, we get rid of one of the (many!) excuses! Don’t try to tackle your entire kitchen at once if you don’t have much time. Instead, spend 15-20 minutes sorting through one or two cabinets a day. Don’t worry about setting aside an entire day to sort and organize your son’s bedroom. Instead focus on a different area each day until the whole room is neat and tidy (and ready for him to mess up again!). Asking ourselves if an item “sparks joy” can be a little difficult to comprehend. What does it actually feel like when an item “sparks joy”? Well, Marie Kondo does give advice on how to flex your “joy muscle”, but there are somethings that will never spark joy, but you still need to keep. I’m not particularly fond of my nail clippers, but I certainly need to keep hold of those (but I don’t need 7 pairs of nail clippers!). So instead of asking “does it spark joy”, instead ask yourself if you would buy it again. If you got rid of that one item, how likely are you to buy it again to replace it? For example, if you are sorting through your clothes and you come across your only pair of black jeans – if you got rid of them, would you end up just buying a similar pair again in the future? But there is an additional aspect to this alternative, it’s called the “20/20” rule. Basically, if you can buy that same item again for less than $20 within 20 minutes, then you don’t need to keep it! I used to keep all my leftover paper party plates, cups, napkins etc. I had a BIG box of them! My reasoning was that I would be having more parties, so why throw away the excess when I’m going to use them again? Instead, I needed to apply the 20/20 rule. I can easily replace the paper partyware for less than $20 and it would take less than 20 minutes. So my leftover products should be donated instead (school and preschools are always grateful for leftover party supplies!). When we are decluttering our homes we tend to think in 3 categories – keep, donate or toss. But there is a 4th category that can make the decluttering process easier and more effective. If you have 200 CDs or DVDs that are still in their boxes, they will take up a LOT of space. Maybe you don’t want to part with all the discs, but equally, you don’t have space to house all 200 of them. Instead, you can condense them down. Ditch the boxes, but keep the discs in a folder (like the one in the photo below!). Not only does it keep your collection contained, but it will take up a LOT less space. We can apply the same principal to something like your child’s artwork. You don’t want to throw it out, as it’s fun to look back at their pictures when they are older. But do you really need to keep boxes and boxes of artwork? Instead, you can either take a photo of the artwork and keep it on your computer. Or you can use a service like Artkive. They will scan the artwork and create a beautiful photo book instead! You could do one book for every school grade level? What a wonderful memento for your child! So rather than jumping straight to the “toss” decision, think about if there is a way to condense your collection so it takes up less space (and is still organized and easy to access). One of the hardest part about decluttering a home is that you will lose momentum! You will start off full of energy and enthusaim to get your home organized, but after a few days you will run out of steam! Instead of tackling the decluttering project all on your own, you could follow a schedule or plan to help you stay on track. I have a free (yes, I said FREE!) 30 Day “Time to Get Organized” Challenge that takes you through all aspects of your life and help you flex your organization muscles! It will teach you key skills to get your home and life organized, so you can start feeling more relaxed and in control! Sign up below! So there you have it! 5 useful alternatives to KonMari decluttering! Hopefully you can use these tips to get your home a little bit more organized and tidy… because you deserve to have a home that you feel proud of! 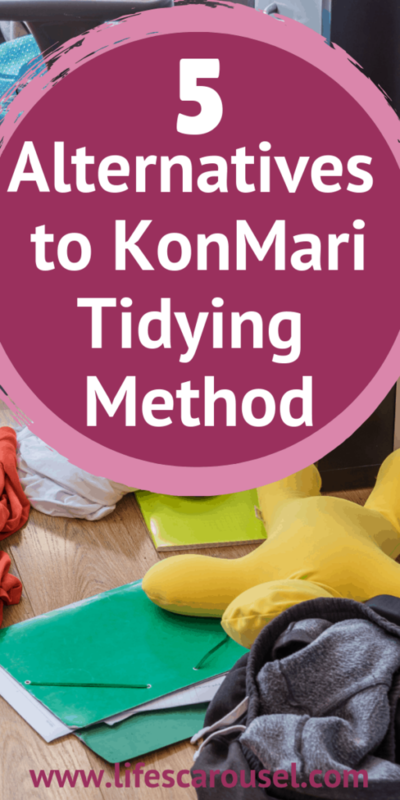 You can check out my post all about the KonMari Method (I even have a KonMari checklist!). As I mention above, the Mari Kondo method of tidying up isn’t for everyone. But everyone does deserve to have a tidy home! Just because one method isn’t right for you, doesn’t mean that all organization and decluttering methods aren’t right for you. Keep trying until you find one that clicks! Yep! I’ve personally used all these methods as a professional organizer with my clients and also in my own home! Any organization strategy takes time and effort, but it is worth it! I no longer see private clients as a professional organizer, but I do have a FREE decluttering ebook that will give you tips and tricks to get your clutter under control! You can also contact the National Association of Professional Organizers to see if they have a registered professional organizer in your area. You might also be interested in my Weekly Cleaning Schedule, to help you keep your home clean once you’ve got it organized! We no longer use dressers, we have a closet with shelves instead. I told clothes the Konmari way but put them side by side within the shelves rather than front to back. It works but I need to use more shelves otherwise I am still stacking them and that can make a mess. The only things I put in a basket are socks and underwear. Shallow baskets work well. My suggestion would also be to try on each clothing piece when deciding what to keep. That can eliminate a lot as well. Those are some great ideas! Thanks.